Building for movies and entertainment to be built in Kalaupapa, 1915. Because of the benevolence of the Board of Health [Papa Ola], by them taking up the building of a Movie and Entertainment House for the Patient Colony [Kahua Ma’i] here, we therefore revoke our Requests put out by us to the Fundraising Committees which were approved by us. As for the Committees that collected money for this endeavor, please send it to the Secretary of the Committee, Mr. Joseph Aiona, or to the Superintendent [Lunanui] of this Patient Colony, Mr. J. D. McVeigh. Ka Hoku o Hawaii, Buke 10, Helu 30, Aoao 3. Dekemaba 30, 1915. 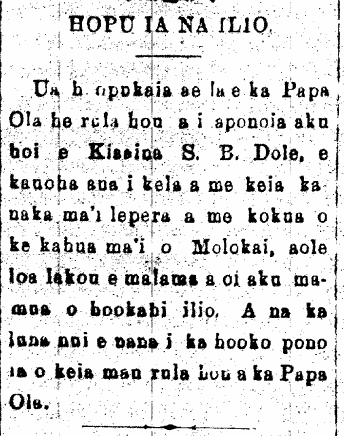 Complaint against police officers in Kalaupapa, 1903. RESPONSE TO THE POLICE OF KALAUPAPA. The officers of Kalaupapa nei have made a petition asking the Legislature to increase their salary to $30 per month, being that their current pay is just $20; the asking of the officers for $30 a month is very questionable. What great work do we see them doing; is it going around to the homes of the patients and entering without search warrants, or when the Sheriff gives them orders, these officers do as they please? They brush aside the orders from their Sheriff and return; they did not put their petition before their head, J. K. Waiamau [Deputy Superintendent], and I hear that they were all admonished; I truly believe that $20 a month is enough for them. Here is another thing, your writer has heard that five kokua are being sent out, two men and three women. They have only two weeks to ready their belongings. Our Superintendent [McVeigh] is bristling. I stop my pen here, and to the metal typesetting boys goes my greeting of good-bye all. 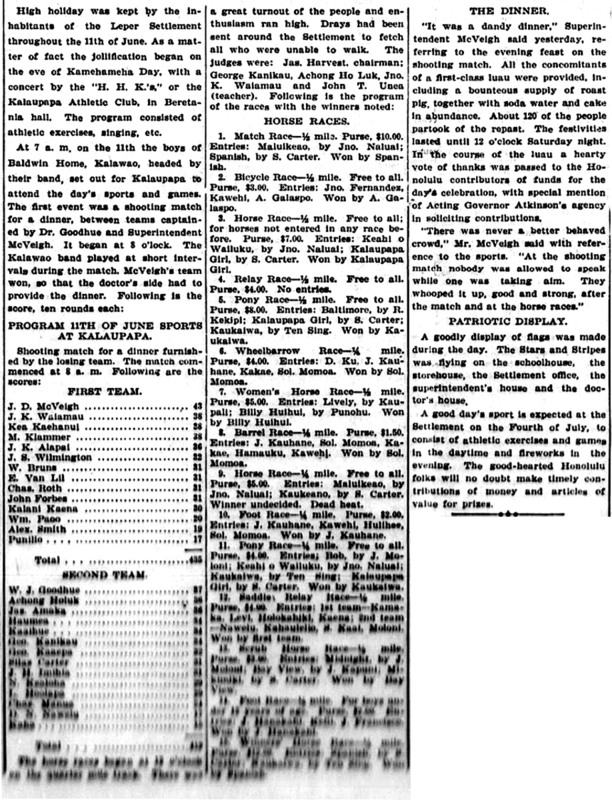 Kalaupapa, Molokai, April 21, 1903. Ke Aloha Aina, Buke IX, Helu 17, Aoao 8. Aperila 25, 1903. Kokua being sent out of Kalaupapa, 1903. According to reports, most of the assistants [kokua] and the people who have been diagnosed not to have leprosy have requested of the Board of Health to remain in Kalaupapa. Amongst these requests, four have staunchly opposed their being removed from the place of the sick. In accordance with the thought of the Board of Health, some requests were granted while others were denied. The petitions of Mrs. Jessie Kaeana and Mrs. Lahela Amaka for their husbands to go to the colony as kokua were approved, and Superintendent McVeigh [Lunanui Maka-we] helped in this. C. Kopena, a kokua that was ordered by the Board of Health to leave, asked that the decision be changed. The Board of Health gave the 31st of August as his last day to live in the colony. Kopena stated that he lived there for a long time and has not in the least gone against the Board of Health. When he left for the colony, he sold all of his assets, believing that he would spend the rest of his days there; and now, he is unable to return to the outside world unless he has supplies. If the Board is set upon his leaving, he needs to be given a home outside, and if not, he will become a vagabond of the earth. According to Superintendent McVeigh, Kopena refuses to work, and has tried to join in with the rest of the kokua to defy the power of the Board of Health. For this reason, the request was denied. McVeigh stated that when telling Kopena the Board of Health decided to remove him from the colony, Kopena said, “ko ke hele”¹, and that he would be staying. That was not the case of Mr. and Mrs. Imihia. They asked the Board to allow the two of them to live there because they have no ohana left living, and they don’t have enough money to sustain them for two days. Mr. McVeigh asked that they live in the colony and he said that Imihia works hard and is a farmer. The request was approved. The request of Simms was denied for him to continue living in the colony, because he was suspected of having leprosy, but he will be released after he receives his clearance. According to the explanation of McVeigh, Simms is one of the most lazy blacks that he has seen, and he should be sent out to work for himself. The request of Sam Kaaiko and his wife was approved to go to the colony to visit their child. Mrs. H. K. Aylett’s request was denied to take her young child to the colony. Ka Nupepa Kuokoa, Buke XLI, Helu 32, Aoao 3. Augate 7, 1903. Patients of the leprosy settlement present gift to the Waipa Trio, 1922. By way of the director of the leprosy settlement on Molokai, Mr. J. D. McVeigh, the patients gave a gift to the Band of John Waipa (The Waipa Twintett) [Waipa Trio]; that singing and musical group that travelled with Representative H. A. Baldwin, to Molokai, in his effort to increase voting; and on this past Monday, Director J. D. McVeigh carried out the duty given to him, by him appearing before Mr. John Waipa and presenting him with this gift, a sum of money donated by the patients of Molokai. There are three people in that band: Mr. John Waipa, Mrs. Waipa, and Miss Flora Waipa; and because of the great joy and admiration that the patients had in the band, they showed this through the sending of this present; the gift was grasped by Mr. John Waipa and his family with pleasure, and they were filled with awe at this act done for them by the patients. For this esteemed gift given by the patients of Kalawao and Kalaupapa to the singing group of Mr. Waipa, he and his family extend the endless appreciation to all of them, along with their request to all those who gave the gift, to accept their thanks and to always remember that their gift will be something for them to remember throughout their lives. They also give their great appreciation to Director J. D. McVeigh for the warm hospitality extended to them while they were at the settlement on Molokai; and above all else, it is God who gives his highest blessings from above. Ka Nupepa Kuokoa, Buke LXI, Helu 17, Aoao 1. Aperila 28, 1922.